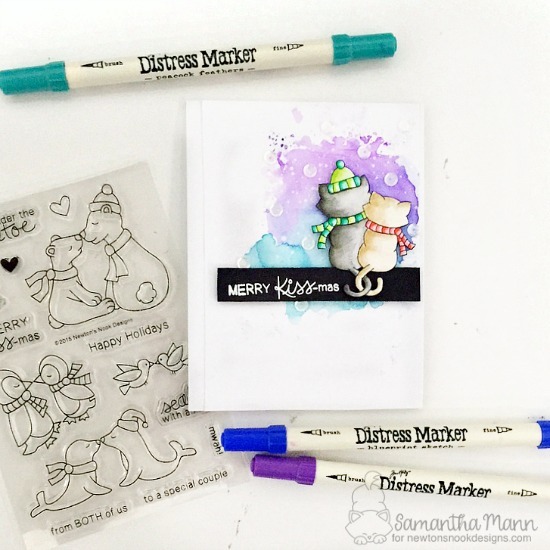 Today, Samantha has a card using two of our sweet Christmas stamp sets from last year! She used the adorable Holiday Smooches for the heat embossed sentiment and the cute Newton's Christmas Cuddles stamp set for the image! The adorable duo of cats were watercolored and then popped up against that winter-y watercolor-y sky! I love the sequins for stars! Thank you Samantha for this fun, holiday card! Awww Samantha, this is sweet! Great color choice!!! So sweet and absolutely amazing!